Healthy Quinoa Chocolate Bark, packed full of superfoods like quinoa, chia, hemp, and pepitas! 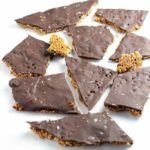 If you love chocolate as much as I do, I’m sure you’ll love this quinoa chocolate bark with chia! It’s a healthier option than the chocolate barks I usually make. It’s chock full of superfoods, like quinoa, pumpkin and sunflower seeds, hemp and chia. Not only that, its crunchy nature makes it deliciously addictive. 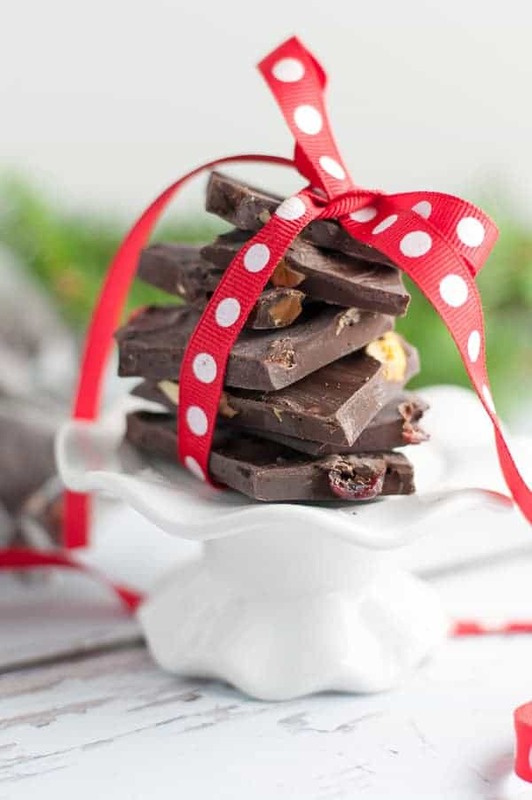 Chocolate bark is the go-to after dinner sweet treat I often make for a dinner party when I’ve run out of time. 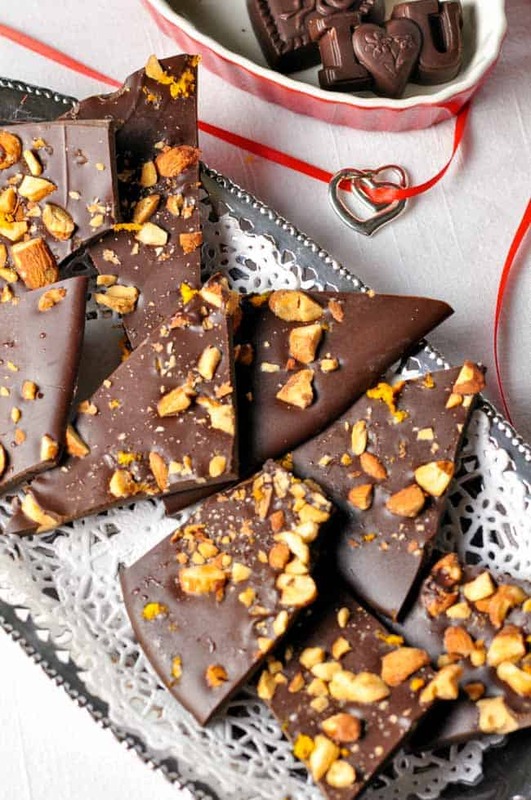 I can create it in just a few minutes and I’ve yet to meet anyone who doesn’t like to end a meal with a piece of chocolate. This is a simple two-part recipe. 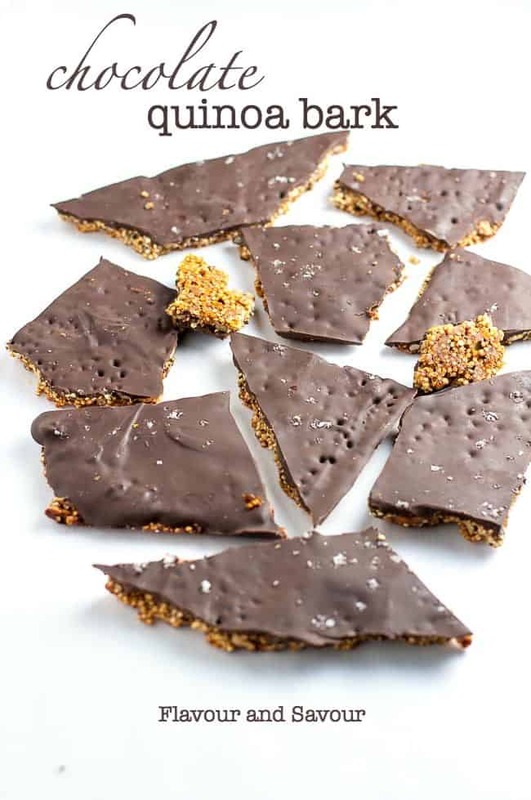 Mix quinoa, nuts and seeds (use your favourites or whatever you have on hand) together with maple syrup (or honey) and coconut oil, spread in a thin layer and bake in the oven. While it’s baking, melt and temper some quality dark chocolate. Once it comes out of the oven, spread the chocolate on top, sprinkle with a little fleur de sel and chill in the refrigerator. Break into pieces once it has set and enjoy! 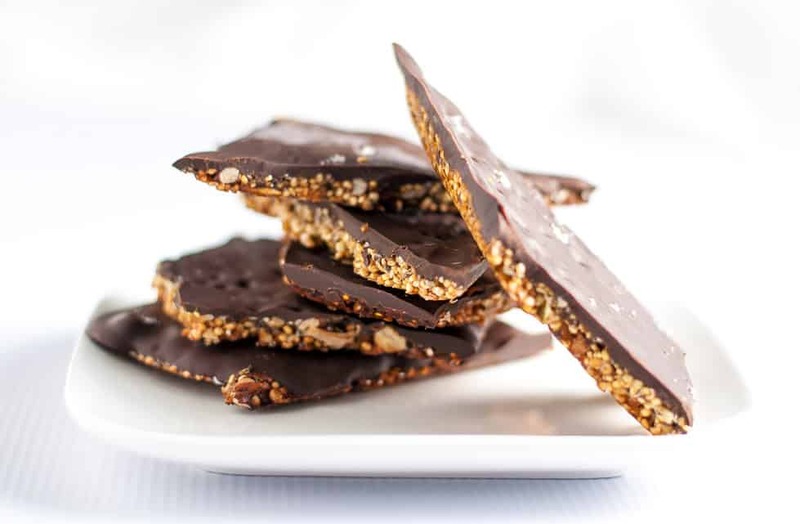 This Healthy Quinoa Chocolate Bark is full of superfoods, like quinoa, chia, hemp, pumpkin seeds, sunflower seeds, nuts and coconut oil. It's deliciously addictive. In a small saucepan over low heat, stir maple syrup and coconut oil until oil has melted. Remove from heat and add vanilla and salt. In a medium bowl, stir together quinoa, pecans, pumpkin seeds, sunflower seeds, hemp seeds, chia seeds and optional espresso powder. Add maple syrup mixture and stir until well combined. Spread evenly on prepared baking sheet. Bake for 20 - 25 minutes or until golden brown. Watch carefully and remove from oven if edges are beginning to brown too quickly. Meanwhile, melt 3/4 of the chocolate in a glass bowl set over a pot of simmering water. Once melted, remove from heat and add the remaining chocolate pieces. Stir until completely melted. Spread over baked quinoa mixture. 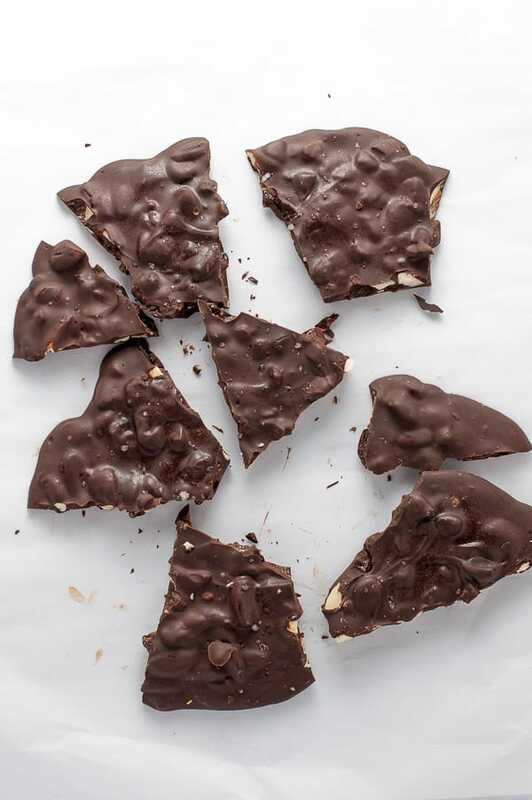 Refrigerate for 30 minutes (or freeze for 15 minutes) until chocolate has set. Break into pieces. Store extra in the refrigerator or freezer. 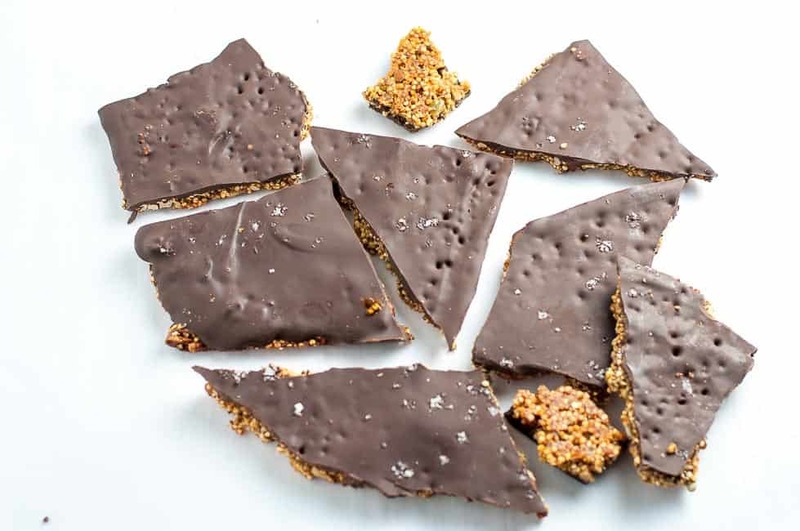 Using a quality dark chocolate like Ghirardelli or Bernard Callebaut or a quality vegan chocolate will make all the difference in the world to this bark. * using a pre-rinsed brand of quinoa, like Ancient Harvest, in which the natural coating called saponin has been removed, works well for this recipe. I adapted this recipe from Tieghan’s beautiful blog, Half Baked Harvest. Elaine, you have done it again. Irresistible!! Tomorrow first thing I will be getting the dark chocolate. I am rating this recipe for inspiration before I try it and based on past experience with your recipes I am confident it will be a 5. Welcome back! Thanks Jackie! This was devoured far too quickly in our house! Need to make another batch . . . Thanks also for stopping by today and for the lovely comment on my latest post! This looks amazing, Elaine. I love that you can have your chocolate guilt free, in fact good for you! I have to try this one for sure. Thanks for sharing. Thanks Colleen1 Lots of nutritious ingredients in these little bites! This is a great recipe and I have all the ingredients to make it. That is just what I need when my chocolate cravings hit 😊. This look so good and protein packed! And chocolate mmmm. Great question! I should have mentioned (and I’ve now added this) that I used pre-rinsed quinoa so the natural saponin has been removed. The bitter taste of unrinsed quinoa bothers some people, while others have no problem with it. There are a few quinoa brands on the market (like Ancient Harvest) that are pre-rinsed. I hope this helps–and I hope you like the recipe! Thank you so much for replying back, will definitely it this week 🙂 I’m sure it’ll be amazing!